Pickups are known for offering a plethora of customizations and choices, engines, trim levels, and accessories, and the new 2016 Chevy Silverado is no different. There’s no denying the Americans own the pickup scene, and it’s trucks like the Silverado that really make that statement true. Brand-new for 2016, the Silverado might have looked tough before, but now it looks youthful and rugged with a brand new front end and lots of great new technology. Pickups are known for offering a plethora of customizations and choices, engines, trim levels, and accessories, and the new 2016 Chevy Silverado is no different. This workhorse pickup has something to offer everyone, and its bold new looks are sure to attract a host of brand new buyers and followers. Returning for the 2016 model year are the Chevrolet Silverado’s three engines: an EcoTec3 4.3L V6 with FlexFuel capabilities that produces 285 horsepower and 305 lb-ft of torque. Then there’s the EcoTec3 5.3L V8 with either Active Fuel Management or FlexFuel that produces 355 horsepower and 383 lb-ft of torque. At the top of the performance ladder sits the EcoTec3 6.2L V8 with Active Fuel Management and 420 horsepower and 460 lb-ft of torque. New for the 2016 Chevrolet Silverado is the expanded availability of the Hydra-Matic 8-speed transmission (standard on LTZ, LTZ Z71 Crew Cab and High Country models). Of course, there is an available 6-speed automatic still kicking around, too. With the continued availability of trailering packages and transfer case, as well as transmissions that offer two gear overdrive gears as well as tow/haul modes, the 2016 Chevy Silverado is sure to fit the bill for any job, and do the work well, too. 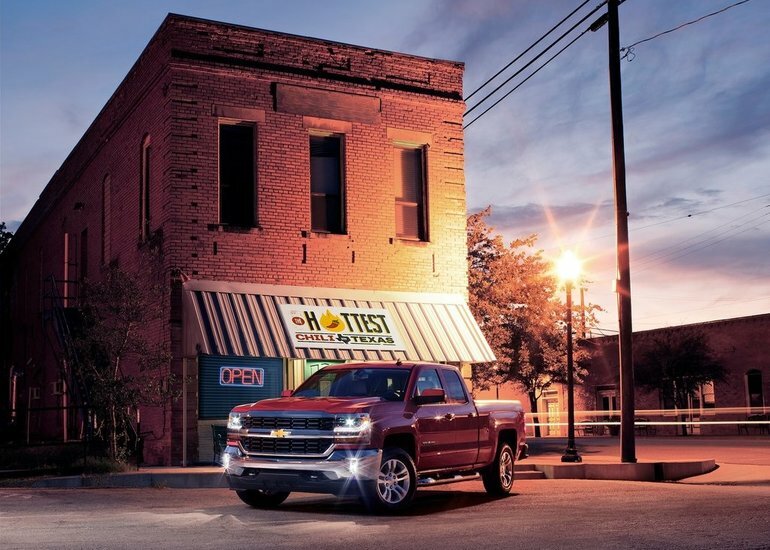 The 2016 Chevrolet Silverado offers a few box sizes from Regular to Standard to Long Box, and the cab can be had as a two-door set up, Crew Cab or Double Cab. The beauty with pickups is that the combinations and options really do seem endless. You can truly customize this truck to suit your needs. Just because it works hard, doesn’t mean it can’t be comfortable and technologically advanced. Inside the 2016 Chevrolet Silverado you’ll find all the creature comforts you would in a regular car: available satellite radio, USB ports, Bluetooth, and new for this year 4G LTE with Wi-Fi connectivity. Chevrolet MyLink is also available, as is wireless charging. There is also available leather seating (heated and cooled), as well as available lane departure warning, forward collision alert, front/rear park assist systems, and OnStar. To find out more about the 2016 Chevrolet Silverado and all it has to offer as the ultimate workhorse, head down to Bruce GM today to speak to our experts about everything this pickup can do for you. And don’t forget to book your test drive, too.